There’s a chapter from the work of our ARC Laureate team featuring in this new book. Really pleased with it. Goodyear, P., Thompson, K., Ashe, D., Pinto, A., Carvalho, L., Parisio, M., . . . Yeoman, P. (In press, 2015). Analysing the structural properties of learning networks: architectural insights into buildable forms. In B. Craft, Y. Mor & M. Maina (Eds. 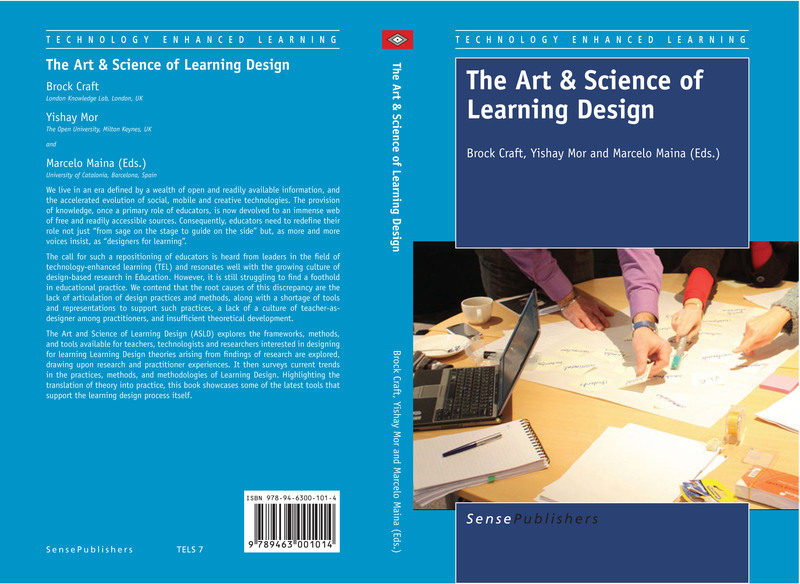 ), The art and science of learning design (pp. 15-29). Rotterdam: Sense. A good repertoire of methods for analysing and sharing ideas about existing designs can make a useful contribution to improving the quality and efficiency of educational design work. Just as architects can improve their practice by studying historic and contemporary buildings, so people who design to help people learn can get better at what they do by understanding the designs of others. Moreover, new design work often has to complement existing provision, so the sensitive analysis of what already exists is an essential part of enhancing, rather than undermining, prior work (Goodyear & Dimitridis, 2013). Since many factors can affect what and how people learn, the scope of analysis for design is broad. In fact, it has to go beyond what has been explicitly designed for learning, to take into account the various configurations of things, places, tasks, activities and people that influence learning. Part of the skill of analysis is knowing how to put a boundary on what one studies (Hutchins, 2010). We believe that analysis of this kind can help improve the design of all kinds of technology-enhanced learning (TEL) systems. But to focus our argument, this chapter draws on our recent collaborative analyses of learning networks (Carvalho & Goodyear, 2014). Our thinking has been influenced quite strongly by the writings of Christopher Alexander on the properties that ‘give life’ to places and artefacts. The first part of the chapter has an ontological function – since analysis involves some decisions about the nature of the existence of its objects of inquiry. The second part illustrates the application of some of Alexander’s ideas to the analysis of the structural properties of learning networks, where the goal of analysis is to inform design.